Marlii Revolution's zombie face paint video tutorial, which I mentioned in yesterday's makeup guide, gave me the idea to do a zombie apocalypse-inspired look. Supernatural drama has maintained its popularity over the years, but recently zombies have been giving vampires, the previous supernatural pinup monster of choice, a run for their money. While vampires usually represent ethereal grace and a highly seductive danger, zombies tend to represent the opposite. They're vile, filthy, and nearly unstoppable. Naturally, when putting together a look for a survivor of the zombie apocalypse, polish and glamor don't really come to mind. Who has time for lipstick when you're trying to keep the rabid undead out of your bunker, right? 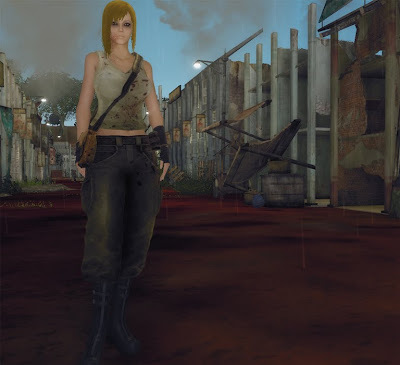 The blood splattered cargo pants and dingy tanktop, along with the attached bags, are the Medic top and pants from the women's clothing shop in Cloud City (Blink Teleport here). Many people don't like grungy clothing in virtual worlds for the same reasons that they don't like them in RL-- because they're dirty. However, it's always worth noting that good grungy clothing requires much more effort than clean-looking clothing. Blood splatters, smudges of mud and dirt, tears in the fabric and all the other signs of a nearly destroyed garment require extra care to place on a piece of clothing. There's a lot of blood and sweat put into (and on) a good piece of post-apocalyptic fashion like this set. Unfortunately, the Medic top does have some seams in the texturing along each side, but seams don't bother everyone. As always, just be sure to try it on before buying so you can decide for yourself! I'm also wearing a ponytail from Cloud City's Hair Today Gone Tomorrow. I chose a ponytail simply because they are more practical when it comes to running around a scorched and barren landscape, while this ponytail in particular has extra long bangs and sidepieces that give a rugged frame for the face. It's mussed, shaggy, and looks more believable than a perfect glossy hairdo would. I've accessorized the look with a pair of boots and fingerless gloves from Moxxi in Port Town Blink Teleport here). The boots in particular are a perfect fit for this outfit, since they meet the cuffs of the pants at the perfect height mid-calf. The final touch is of course makeup. I piled on the black eyeliner and dark purple eyeshadow to make the eyes look a little raccoon like, a signature look for many zombie apocalypse heroines. I used a very pale and sheer green color on the lips to cancel out the pink lips of the skin, so they would instead look more sallow and sickly. Lastly, I used the freckle-like shape option in the face editor to make some bright red blood spatter like the detail on the shirt, and I positioned it to rest on the cheek and down along the side of the neck. Are you ready to greet the zombie apocalypse in virtual style? Head to the Zombie Wasteland (Blink Teleport here) where I took my pictures and take your zombie-fighting gear for a spin! Blue Friday Shopping Deals in Blue Mars! Harvest Homecoming in Blue Mars! IDIA Lab launches IDIA in Blue Mars!